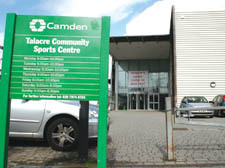 THE country’s biggest sports funding body has launched an attack on Camden Council and made a veiled threat to pull its funding over a planned block of flats it says will threaten the borough’s most popular sports centre. Sport England, the government agency which holds the purse strings to millions of pounds of Lottery cash, wrote to the Town Hall this week condemning a proposed seven-storey development on the doorstep of the Talacre Community Sports Centre in Kentish Town. Sport England officials described it as as “detrimental to sport and to sports provision”. The 55-flat “New Dalby Street” development on Prince of Wales Road was granted planning permission in 2006 along with a deal granting it council land, but has been held up by disputes over the massive road changes needed for it to go ahead. The development will be built on the only road leading to Talacre sports centre and will impinge on its forecourt, while a new, private road will open alongside. The New Journal understands that Sport England’s planning chief, Conal Stewart, wrote to Camden chief executive Moira Gibb this week, arguing that Camden should have asked his view on the development, and that he would have objected in the “strongest terms”. Sport England stumped up £3.46million of the £6m needed to build Talacre Community Sports Centre, which is the borough’s most successful leisure facility. During last year’s summer holidays alone, 4,500 youngsters used the centre’s Treetops scheme, and successive councils have boasted of its 300,000 vistors a year as evidence of their commitment to sport. Any threat to Sport England’s investment in the centre could in theory lead to a highly embarrassing claim against the council, which has strong interests in keeping the sport investors sweet while it embarks in the £25m refurbishment of nearby Kentish Town baths.